The kitchen is at the heart of every home. But this means a lot of different things to a lot of different people. So, what does it mean to you? Is it a place to eat and drink with family and friends? Maybe it’s where you post up with coffee and a newspaper on Sunday mornings. In this short guide, you’ll find lots of help and advice to design a kitchen which works for you. 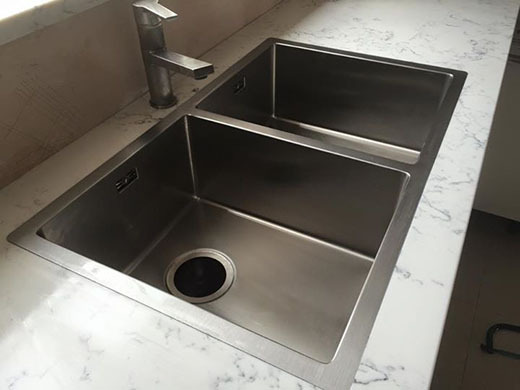 Much of the advice will centre on choosing the right kitchen worktop because we think the kitchen counter makes up a large part of your kitchens overall look and feel. We’ll also cover how to pick the right layout for the space, as well as the finishing touches. Good kitchen design begins with getting the layout right. The layout has to suit your tastes in a practical way. Make sure your selected layout matches the shape of your room, makes the most out of natural light sources and does not obstruct the ‘flow’ of your kitchen. You also need to ensure that your sink, oven and fridge are laid out in a triangle arrangement to make cooking a breeze. L-Shaped kitchens maximise floor space and can make small to medium-sized kitchens feel light and breezy. 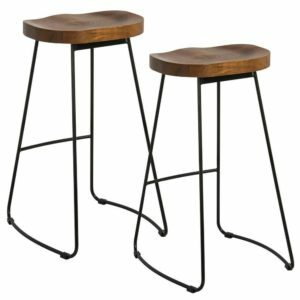 They also work great for kitchen-diners. Got lots of hungry mouths to feed? Need lots of food preparation and storage space? A U-shaped kitchen might be perfect for your needs. Kitchen islands are very diverse pieces. They can be used as breakfast bars, preparation stations, storage space or just about anything else. Galley kitchens make creative use out of long, thin spaces. Practically, they take some careful planning, but when done right they can look great. The modern kitchen is typified by clean lines, shiny surfaces and slick shapes, rounded off with bold colour contrasts and subtle design twists. The laws governing modern kitchen design remain largely undefined, so don’t be afraid to experiment a little. But ensure you keep your creative spirit in check. The key to good design is achieving balance. Don’t try to follow one particular scheme to an austere degree, instead try to create harmony in colours, layout and material choice. We’ve seen synthetic elements like concrete, enamel and stainless steel used to good effect. 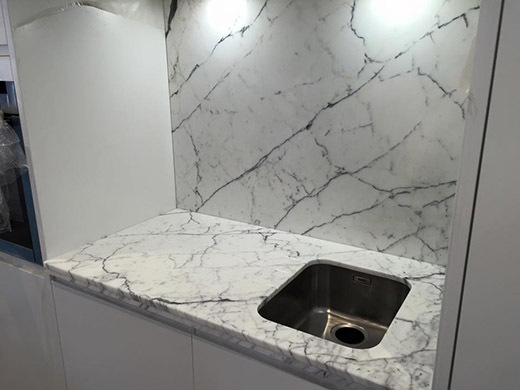 But it’s important to offset these bold choices with some more natural selections like wood, granite and marble, as well as treated ‘natural-look’ stones like quartz. Using granite in a modern kitchen often means choosing a monochromatic coloured slab or one with a very minimal imprint. 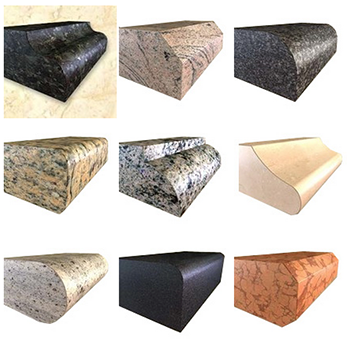 These stones look great and almost guarantee a sharp colour scheme throughout your design. Modern kitchens are often planned with informality in mind. Whether it’s a comfortable sofa in one corner or a pop-up power socket where you want the kids to sit and do their homework, modern kitchens should be built around the demands of family life. Source some striking visual elements, but take care not to clutter up surfaces. Including iconic furniture, like a Barcelona chair is an easy way to make a ‘modernist’ statement. 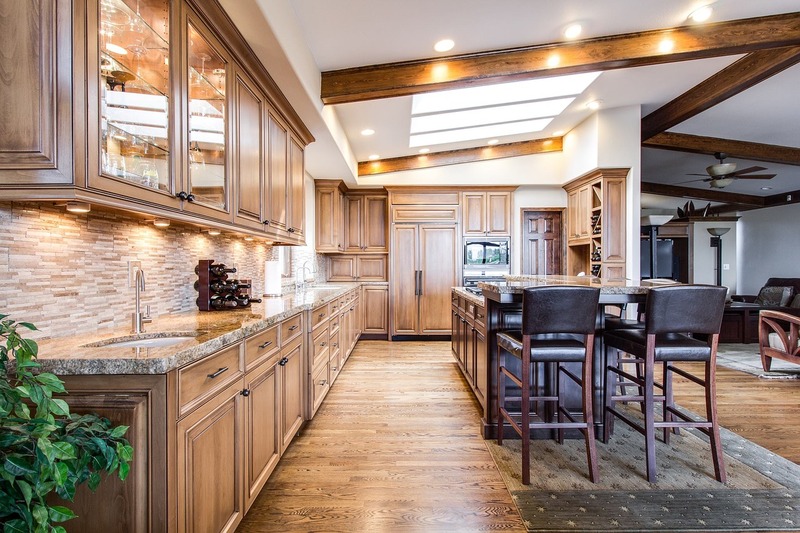 Use spotlights to draw attention to areas of interest in a kitchen. Introduce more friendly colours and textures with upholstered furniture. Draping a comfortable blanket can make a chair look even more inviting. Fresh flowers look great in every modern kitchen. If your design includes an abundance of glossy textures, balance it against a backdrop of coarse stone and wood. 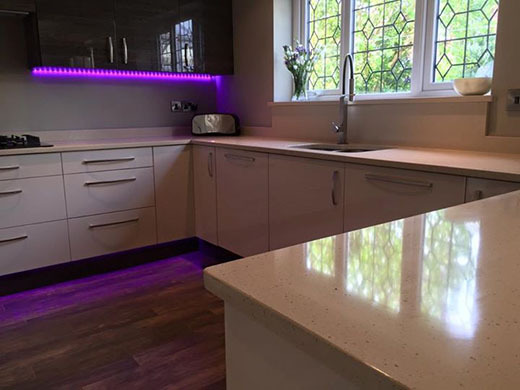 Use downlights to highlight the grain of your worktop in darkness, or install LED lights under cabinets so they appear to float in mid-air. If you are creating an open-plan kitchen, include distinct zones for cooking, eating and lounging. Using subtle boundaries like breakfast bars can help achieve this goal. Traditional kitchens find authenticity in their understatement. And your design needs to reflect this. Natural materials like wood, granite and wicker all have a role to play in traditional kitchens. Pairing natural speckled granite slabs with painted or stained wooden cabinets is one popular way of creating an ‘honest’ kitchen which puts functionality ahead of everything else. Clever use of colour can really bring a kitchen to life. When used sparingly, paler shades can create an airy and open feel which draws attention around the room. 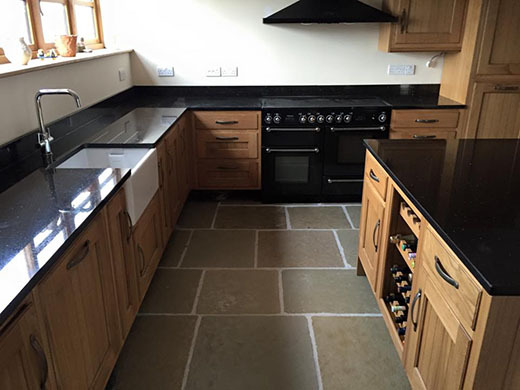 These creamy colours also work fantastically with darker or speckled blocks of granite. Other materials such as antique metal fittings and oversized white ceramics can be used to add the finishing touches to your classic kitchen. To achieve a truly unique look you could try experimenting with period furniture as the focal point of a room. Taking time to collect personalised pieces like repurposed flooring or a chunky antique chopping board can really enhance your design. Helping to create a look which is truly your own. Select decorations and pieces which inject warmth and personality into your kitchen. Traditional kitchens are supposed to look cosy and lived in so comfortable furniture is a must. Uniform sets of chair can look a little dull, experiment with using different shape wooden chairs painted in the same colour. Cushions and blankets should be on-hand and comfortable. Fresh flowers have a place in every traditional kitchen. Unusual antique pieces like handles or sinks can inject bundles of personality into an otherwise uninspired kitchen. Paint or varnish floorboards in an inoffensive colour to give them a wholly new look. When it comes to creating a beautiful kitchen, the devil is in the detail. Overlooking finishing touches at this stage in your project can leave you with an incomplete and rushed-looking room which might not match up to your original expectations. 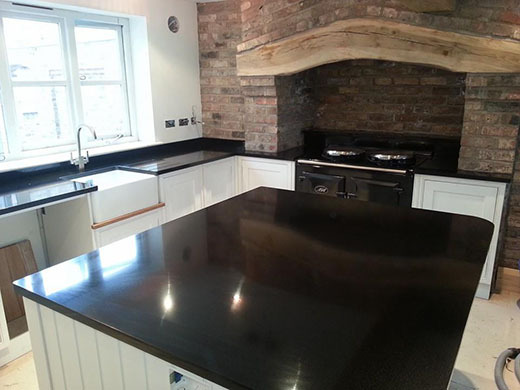 Just like the colour of your granite, the finish on it should be catered to fit the style and look of your kitchen. An edge finish can make or break your design. Back panelling is probably the most overlooked element of kitchen design and it can often be difficult to get right. 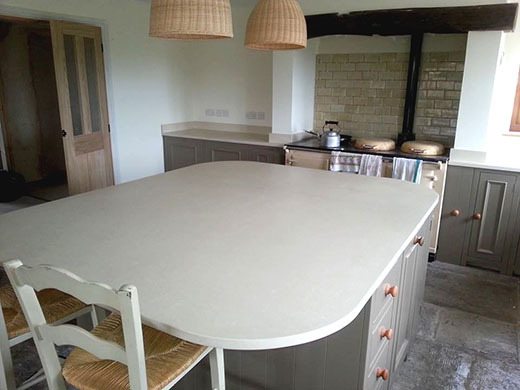 These can come in a variety of different materials and styles, however, if using stone for your worktop, it can look odd if you mix and match materials too much. By far the most popular stone backsplash is the lipped panel. This type of back panel subtly creeps up a wall to provide a sense of continuity as well as some protection for your walls. For projects which call for a bold finish, a full panel backsplash is required. These are great for modern kitchens with ‘monolithic’ design features. But use with caution and ensure the panelling fits the rest of your design. Getting inspiration for your kitchen can be tough. Many of the homeowners we speak to have an idea of what they want but struggle to communicate it. 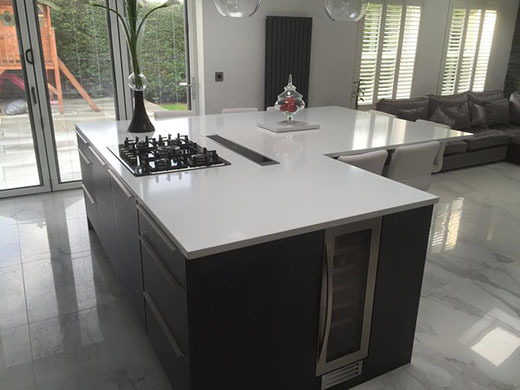 Or, to discuss your design in more detail contact a member of the Graniteline team today.